During clinical encounters with patients, experienced physicians engage in numerous clinical tasks, including listening to the patient's story, reviewing the patient's past records, performing a physical examination, choosing the appropriate investigations, providing advice or prescribing medications, and/or ordering a consultation. These behaviors which provide the basis of clinical reasoning are influenced and driven by "what" physicians think about and "how" they think. New knowledge is best acquired in the context of application of that knowledge in the cases (case based learning and longitudinal mentorships). Along with factual information stored in long-term memory, the learner continues to develop memory schemes for representing and relating the clinical problems in reasoning strategies. Helps the learner develop memory schemes for representing and relating clinical problems. Learning for clinical reasoning is driven by repeated exposures to real case examples that illustrate multiple aspects of clinical reasoning. Repeated exposures to these cases enhance acquisition and storage of knowledge in long-term memory. The Cognitive Miser Function encourages default to Type 1. 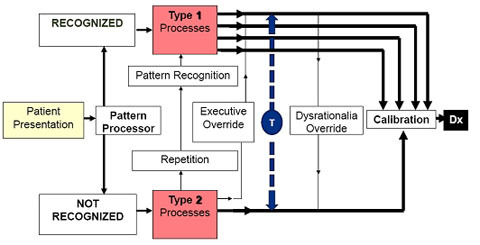 Most errors also take place in Type 1 processing. Information may be obtained primarily through reading, visual imagery, and listening. Other sensory input (e.g., tactile, olfactory) may be obtained. Formulate an initial set of hypotheses. This set of hypothesis is formulated in the context of identified questions and problems in the current case, as well as a knowledge base of prior cases (using illness scripts and pattern recognition). Experts quickly develop a small set of hypotheses with minimal clinical data to represent the problem to be solved. Short-term memory can actively handle only about 5 items at once. Experts will generally have the final diagnosis in this set within 5 minutes of starting. Novice and intermediate learners will take longer to develop a set of hypotheses. Obtain additional information as directed by initial hypotheses. The initial small set of hypotheses forms a framework for additional focused information gathering. This process is repeated and refined. Novices and intermediates have more iterations of this process. Use a reasoning strategy: Hypothetical- Deductive reasoning (deductive v. inductive) to process the information in the clinical context of the case. Hypothetical- Deductive Reasoning: works from general to specific. Develop hypotheses to explain a patient's clinical problem and apply collected information to test the hypotheses in order to try and confirm or exclude a hypothesis. In a hypothetical-deductive process, a classic rank-ordered list of differential diagnoses is generated. If we have certain information, then certain hypotheses may be true, but we test against further information, and therefore it is true or not. This is akin to the scientific principle, in which one tries to prove a hypothesis. The human body is very complex, and we cannot obtain all information we want, so that regardless of the reasoning process utilized, we can never absolutely prove or disprove most hypotheses in many cases. We derive the 'most likely' diagnosis, but we may need to eventually consider others if more information becomes available or the outcome is different than expected. Perform an analysis of hypotheses by probabilistic and cause-effect means. Hypotheses are refined by cause-effect analysis to apply principles of pathophysiology (such as biomedical knowledge and knowledge about basic science concepts) and determine if a hypothesis is based upon a sound scientific basis. Evidence-based medicine is another description of this process. If tests are performed, such as laboratory tests, calculated results for test sensitivity, specificity, positive predictive value, and negative predictive value are useful in analysis. Formulate a final diagnosis/hypothesis (Based on the above mentioned steps) and test the final diagnosis/hypothesis. Test against positive and negative findings and standard criteria for description of a disease process. Working diagnoses for patient are finalized only after they are assessed for their adequacy in explaining all positive, negative, and normal clinical findings. The pathophysiologic reliability of the diagnosis is a check on the reasonableness of causal linkages between clinical events, ascertained from use of biomedical knowledge. Does the diagnosis fit with cause and effect? Is the diagnosis consistent with pathophysiologic principles? To diminish the possibility of premature closure, assume your working diagnosis is incorrect and then consider alternative diagnoses. For example, the illness script for pneumonia differs from that for congestive heart failure in the constellation of features. You will learn features common to both AND which features favor one condition over another. Hypothesis is generated early in the encounter. They are based on cues acquired from the patient by observation and attentive listening. Hypothesis must not be generated too early, that is, before the patient provides suggestive and useful cues. More than one hypothesis is almost always needed, as the best evaluation of a hypothesis is by comparison with alternatives. Develop hypotheses to explain a patient’s clinical problem and apply collected information to test the hypotheses in order to try and confirm or exclude a hypothesis. In a hypothetical-deductive process, a classic rank-ordered list of differential diagnoses is generated. 1. Compare and contrast two plausible hypotheses and prioritize among the competing options. Test the final diagnosis/hypothesis (Hypothesis Evaluation): Perform an analysis of hypotheses by probabilistic and cause-effect means. Hypotheses are refined by cause-effect analysis to apply principles of pathophysiology (such as biomedical knowledge and knowledge about basic science concepts) and determine if a hypothesis is based upon a sound scientific basis. The pathophysiologic reliability of the diagnosis is a check on the reasonableness of causal linkages between clinical events, ascertained from use of biomedical knowledge. Does the diagnosis fit with cause and effect? Is the diagnosis consistent with pathophysiologic principles? Synopsis: The above detailed steps may not be immediately recognizable or flow in the same sequence in the context of actual clinical reasoning. Experts apply pattern recognition with non-analytic cognitive processing during the initial phases of considering a novel clinical case, and then apply analytic processing in hypothesis testing. Novices may work the other way round. However, these two forms of reasoning can be interactive and not sequential. They are complementary contributors to the overall accuracy of the clinical reasoning process, each one influencing the other. Persons who use both perform better than persons using either non-analytic or analytic approaches alone.